When I lived in New York in my late teens, I was introduced to a whole new world of food. New York is an amazing city for countless reasons, but one of the greatest is knowing that no matter what you crave, a dizzying array of cuisines are available to you 24 hours a day. The city is particularly well known for it's Chinese food and one dish that I got turned on to back then and considered a rare treat (since I was living on a $10 a day or less food budget) was Mu Shu Chicken. Just take warm mu shu pancakes (in my world flour tortillas are much easier then making homemade), paint a swirl of hoisin sauce in the center, fill each one with heaping spoonfuls of a finely chopped mixture of chicken and vegetables, fold them up, and voila! It's about as much fun as you can have at the dinner table. 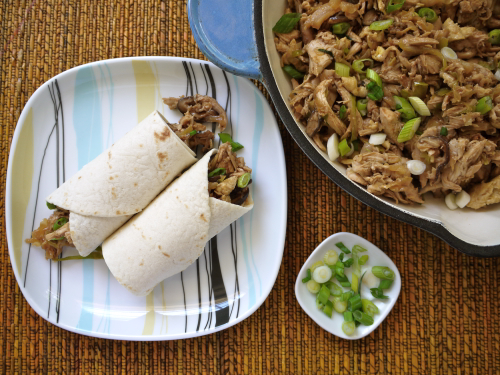 My kids will eat almost anything I put in a tortilla, so I came up with this Mu Shu recipe that's perfect for the home cook. Fortunately it fits my budget a bit better than the New York City version did...and it tastes just as special! 1. Heat 1 tablespoon vegetable oil in a large skillet over high heat. 2. Add the eggs and scramble. Transfer to a plate. 3. Heat remaining 1 tablespoon vegetable oil in the skillet. 4. Add the ginger and garlic to the skillet, and cook 1 minute. 5. Add the cabbage and mushrooms, and cook until cabbage is wilted, about 5 minutes. 6. Stir in the soy sauce, hoisin sauce, and sesame oil. 7. Add the chicken and scrambled eggs to the skillet, and cook until the chicken is heated through, about 2 minutes. 8. Serve over rice or in warm tortillas, and garnish with scallions. I was going to mention the same thing. Poison should never be in a recipe. Is there a substitute I make for the poison sauce? I seem to be all out. ;) great recipe though, in all seriousness. Looks yummy! I thought it was a joke, like \"What's your poison?\" lol Will definitely try this, thank you! I know I've said it before, but I just love your website so much! It keeps me inspired to cook and try new recipes for my family! Thank you!!! Looks delish! Gonna make this soon for sure. trying to think of a veggie version... tofu? no. tempeh? no. hmmm i'll look-into soy proteins. i am CRAZY ABOUT your site (and you). thanks!! You could probably sub portobello mushrooms for chicken. Would add heartiness and meatlike consistency. Aww thanks! You could try seitan! Or mushrooms like I saw someone else suggest. Mmmm I want to eat this!!! How do you suggest cooking the chicken - for simplicity, can you just boil it and then shred by hand or do you have another suggestion? I'm going to try this over the weekend with Gardein veggie Chick'n strips. I would like to make this tomorrow! I would like to substitute regular mushrooms. Do you know approximately how many cups to use? (never used shitake so i don't know how big they are) thank you! It is about 1 cup of sliced mushrooms! I am sure that the sesame oil adds great flavor, but my toddler is allergic. I'm assuming there's no great substitute, that you would just leave it out? Thanks! Yes, it is a wonderful flavor and there really is nothing to compare. I would leave it out if you're not able to consume sesame! Ok, this was super yummy! Made this last night and it was a big hit. Even my 2 1/2 year old tried it. Thanks! Made this tonight...everyone chowed it down. My 16 month old couldn't get enough of it. Delicious. There is no soy sauce listed in the recipe, but the instructions say to add soy sauce. How much?? Please advise!! I am making it this very moment! ^^ I'm trying to remember from the last time I made this .... I think it said to use 1 tablespoon soy sauce. Made this a few nights ago, and the whole family liked it! (even the picky 3 year old and my 17 mo old!) I used a rotisserie chicken from the grocery store to make things easier for this busy mama. : ) Also, my husband and I used sriracha sauce on ours, since we like all things spicy. Thanks, Catherine! Oh my goodness. This recipe is a keeper! I just whipped up a batch for dinner tonight. Perfect amount for my honey and I to have dinner with leftovers for lunch tomorrow. Served it with a side of steamed broccoli with half a lemon squeezed over. Thanks! Would print the picture and info under picture about \"Mu Shu Chicken but would not print the recipe. Could you let me know what I might be doing wrong. I would tell it to print pages 1-2 and it would print the picture and the words under it and the name Mu Shu Chicken.... it would put out a second page but it would be blank so no recipe info at all. Hmm I'm not sure what the problem is. I just tried printing out this recipe and it worked just fine. I did it as a 4x6 card as well as the full page and both versions came out just fine. I'll pass this along to my IT person to see if they can help! Lovely recipe. Thank you and have a super-Sunday!